Topical Aid Kit - 6 Full Size Topical Products and a FREE bag! All Products in the Topical Aid Kit Are Full Size and available for individual refill purchase as you run out. Natural-minded people know that there are many ways to address health using ingredients provided by Mother Nature. 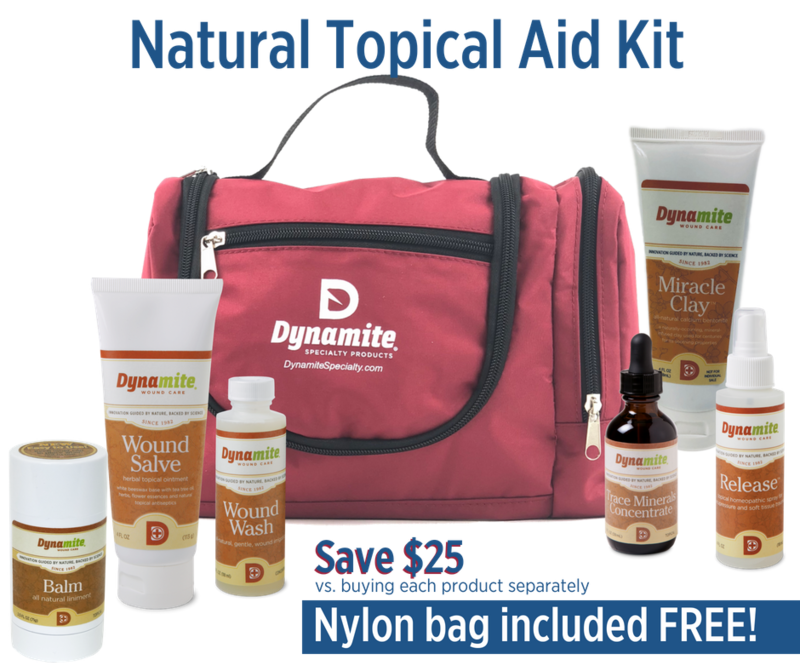 Dynamite’s Topical Aid Kit is a combination of our six most popular topical products that have been thoughtfully created out of natural, plant-based and/or homeopathic elements. These ingredients have been used for centuries to help support the body’s natural ability to heal. The best part of natural products is that the side effects are little to none, unlike many “big pharma” products. FREE nylon, zippered bag with pockets to add your favorite first aid items! Each item in the kit is also sold separately for easy refill.